Was there any consultation with the staff, whether cyclists or budding cyclists? The racks where put in before any tennants moved in. I have no idea if there was an consultantion before this style was choosen, I would like to say not, as any cyclist that has used mudguars will know that this style is a problem. Dont you just hate when people do not think for themselves? I know, i don’t like to park my bike there but i’m often forced to due to other people taking the spaces I can put my bike which is not in the way of any other vehicles. So far no one has had to use it, so it’s not been a problem so far but who knows if anyone will need it in the future. Not an ideal solution, but if there is no other alternative, SKS make a ‘Commuter’ mudguard which is a little bit shorter at the back so you can stand it up on the back wheel. If you’re a DIYer, most plastic and metal full-length mudguards can be shortened. Cut to the desired length with a fine-toothed saw, scribe a radiused end with dividers, radius cut end with a file, drill-out the rivets and re-rivet with pop rivets. If there’s a reflector, this may have to be ‘placed in stock’ for later re-use and a new type fitted. Where I wrote: “drill-out the rivets and re-rivet with pop rivets”, I should have written: If the bracket for the stays needs to be moved, drill-out the rivets, reposition, mark holes, drill holes for pop-rivets and re-rivet with pop rivets. Use aluminium rivets, for ease of removal. Stainless ones can be used, but they’re more difficult to remove. Passive-aggressive signs are best answered with another sign. Or better yet, mark up the existing sign with your counter view. This is EXACTLY the problem we had at our employers. Too many cyclists for too little racks. 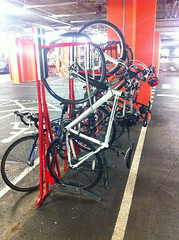 It took 5 years of hard work by the bike user group of employees to get an extra 200 racks put in. Add into that those who drove to work began using larger vehicles, parking bays had to be repainted to accommodate them, now they have been granted some extra few hundred parking spaces (much of which has meant building extra storeys for cars over the car park). The trouble is many employers love the idea of expanding but rarely think of logistics such as modes of transport leading to parking issues onsite and in the neighbourhood. Is there a bike user group where you can air your concerns? 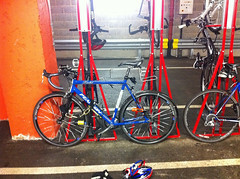 Those upright racks can cause problems, not least warp and damage to mudguards. They can also damage rims when the bike is secured (if its the type I’m thinking of) so all users should be made aware that its something they need to look into. As Bristol Traffic said – the issue here is demand. There are too many bikes and too little stands by the looks of it. In my very honest opinion there should be clear regulations on how bicycles can be parked to minimise problems, ease access and maintain safety. Stands should have standards. Car parking spaces have standards, so why not cycle parking? Those racks look worse than the ones at my work. The people who buy this equipment are never cyclists. I went to the first (and only) bike user group for my office complex in the city. There were three people who cycled and the rest were facilities staf who had no idea. In one of the other buildings they has put racks so close together that bikes wouldn’t fit next to each other. I hope they do actually listen, altough it’s hard if the building is leased. Working out between tennant and landlord who pays i complicates things. You could argue that it is not actually possible to ensure your bicycle is ‘secured with an adequate security device’ if you up-end your bicycle as they suggest. As for the black text at the bottom of their sign, perhaps the Building Management Team could explain in less mangled and indecipherable English what they actually meant. That is something I have raised several times, just going to have to keep applying pressure. Of all the designs of bike storage I’ve encountered, this would seem as bad as the toast-rack / wheel bender type. 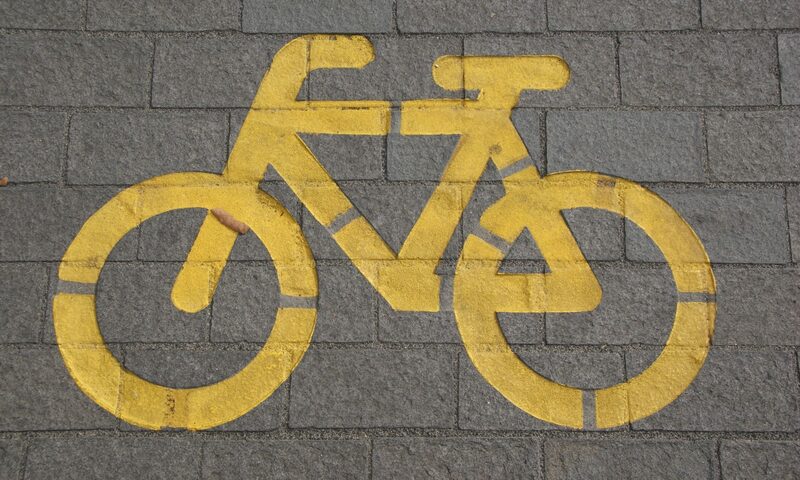 Seemingly designed by someone who’s only ever seen a photo of a bike. The wheel bender racks we used to have at my works were largely unused. Those that did use them turned the bike sideways and secured them in the traditional sense – through the frame. 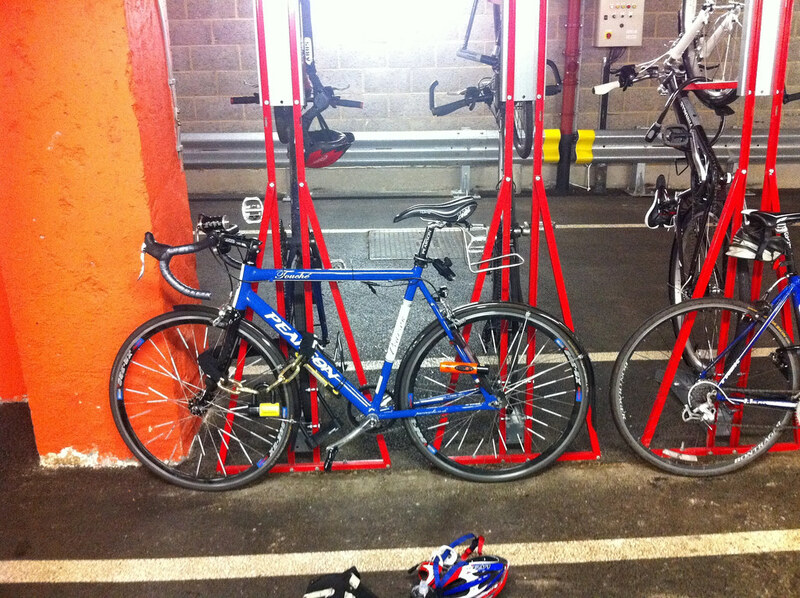 We’ve recently had cycle parking installed at work. 8 ‘wheel benders’, each about a foot and a half away from the next one. Bikes have to be put side on to be anything like secure, so the total capacity of the new facility is, at a push, three bikes. I appreciate the gesture, but the implementation was obviously done by a non-cyclist who didn’t bother to think about it. TFL and CTC even provide guides for estates type people, telling them what’s good and bad. This is really frustrating. 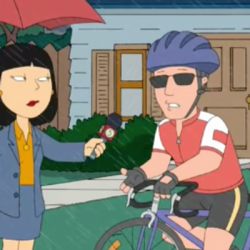 The crazy thing is that your bike isn’t in the way. Perhaps a way to get what you want is suggest an alternative rack (and location) so at least there is a choice of rack to suit everyone’s needs. 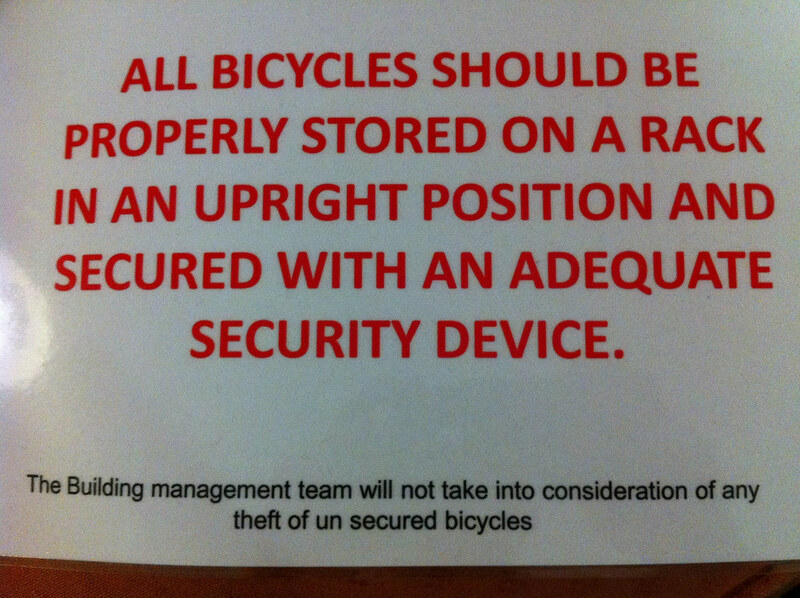 Obviously the building management are not going change 400 racks, so possibly the above would be a good compromise. I find it’s best to approach these things with a solution – so If it were me, I would source a rack or two and give prices along with any cost implications of fitting. You guys are pretty lucky to have such good facilities though. I live in North Devon and whilst my employer doesn’t provide any facilities (other than Cyclescheme) the council provide close to sod all! There are a few of the bars to lock the bike to, which I hate using as the paint from them marks my frame, also to be used my two bikes the other user has to manipulate your bike is order to get his close to the bar (yet more marks). There are 5 bike lockers, but they are locked and sealed and full of rubbish. After repeated letters the council don’t want to know. I have yet to receive a reply! Anyway, great blog, and great vids, always a pleasure reading and watching! Have an anchor point fitted to one of the car bays and park it there. You’ll only be taking up the same space as most of the other vehicles; they can’t possibly complain about that! Perhaps you can create a cheap contraption to allow you to use the rack and still keep your mudguard off the floor of the rack. Try a wire Kitchen Towel Holder from Poundland and bend the upright into a kind of S shape with a horizontal section at the top parallel to the round base. The gap between the wires is about right to hold a 23mm tyre – a cable tie may help. The gauge of the wire should be sturdy enough for the weight of the bike, but no guarantees! I have a photo of one I mocked up but couldn’t post that here. It was difficult to tell from your photos how wide the base section is (the diameter of the towel holder base is just under 110mm). If that would not fit, I hope it gives you food for thought.